Project Location: Located over Fryer Creek at Newcomb Street, extending east along Newcomb Street to the intersection of Newcomb Street and Fryer Creek Drive. Project Description: The Fryer Creek Pedestrian & Bicycle Bridge Project (project) will include the construction of a new bicycle and pedestrian bridge/path and circulation/accessibility improvements along Newcomb Street and Fryer Creek Drive. 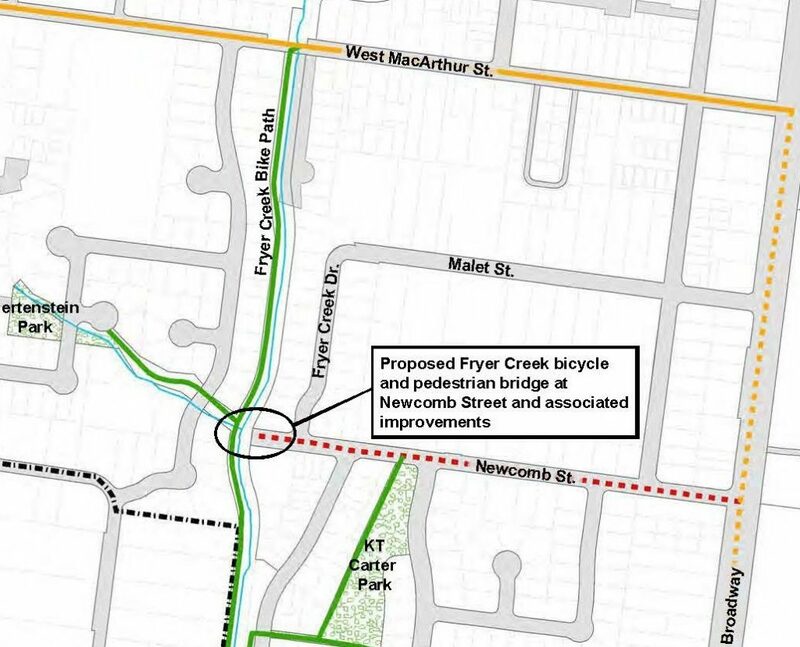 The bridge will be constructed over Fryer Creek to connect Newcomb Street on the east and the existing multi-use paths and Manor Drive on the west. 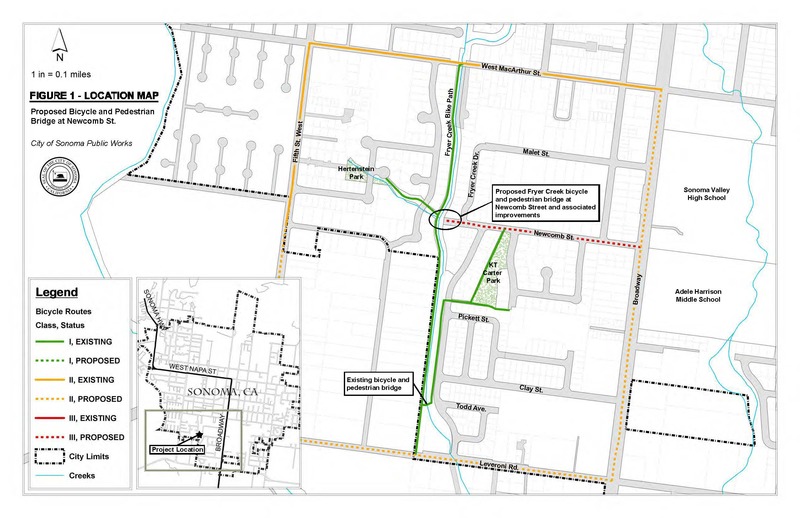 A new 8-foot wide, 60-foot long paved bicycle and pedestrian path will extend from the eastern bridge approach to the existing residential driveway on the north side of Newcomb Street. A new sidewalk and associated curb and gutter will be constructed along Newcomb Street. This project will be located within the City right-of way. Project Budget: In the Fiscal Year 2018/19 Capital Improvement Program budget, the City Council approved $132,000 of State Gas Tax funding as well as $48,000 from the City’s General Fund for the design and environmental phase of this project. The City was also awarded a federally funded One Bay Area Grant (OBAG) through the OBAG 2 program led by the Sonoma County Transportation Authority. This grant is expected to partially fund the construction phase of the project and is currently allocated to be available in the Federal Fiscal Year 2020/21. Project Status: The City is in the design and environmental reporting/permitting phase of this project. Currently, City staff and their consultant team are coordinating with utility companies/agencies regarding existing utilities, including water, sewer, and electrical lines, that cross Fryer Creek near the proposed alignment of the bridge. Construction is expected to occur in the summer of 2021.